The VARIO app was developed for an optimal interaction with your C. BECHSTEIN instrument and enhances the most popular functions of the VARIO digital system. Please note the system requirements and recommendations (below). The innovative Metronome is the perfect companion for practicing, allowing you to create even complex rhythms with just a few taps. Use the convenient Tap Tempo function and choose from 4 great-sounding metronome variations! With the VARIO app you get a new, comfortable recorder for recording and playing an almost unlimited number of titles. Two tracks (e.g. for left and right hand) are available. Play with metronome or completely free. And you can also change tempo and key later on! Share your music with friends, family or even your music teacher by sending your own live recording via the convenient "Share" function. Email, iMessage, AirDrop via Bluetooth - it's incredibly easy and intuitive! Sharing also works with many other apps available on your iOS device, such as iCloud, Dropbox and many others. The piano sound of the VARIO app is available to all users right from the start - so you can turn even entry-level digital pianos into a little BECHSTEIN! Exclusive advantage for our VARIO customers only: enjoy all sounds of your VARIO module directly in the app and benefit from the new 4-band parametric equalizer! • Impressive real-time 3D graphics based on Apple's GPU-accelerated Metal framework. 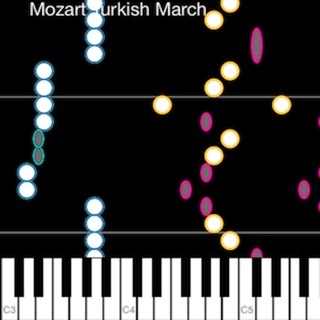 This app feels like a part of your piano! All VARIO models manufactured since 2012 can be used with the new VARIO app. However: the app works perfectly with any digital piano too! The app requires an iPad or iPhone with 64-bit support (recommended: devices built in 2015 or later, e.g. iPad Air 2). The Apple USB Camera Connection Kit is required for USB connection (available as an option).